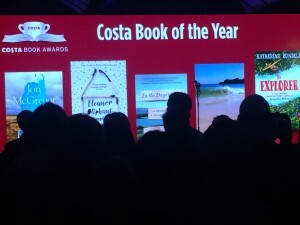 Last night was the Costa Book Awards ceremony at Quaglino’s in London, a truly uplifting celebration of some of the best writing in Britain today. 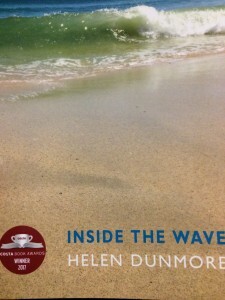 The overall Book of the Year prize went to Helen Dunmore’s incredible poetry collection, Inside the Wave, many of them written in the last weeks of her life. Dunmore, who died of cancer last year aged only 64, is the second writer to win the Book of the Year prize posthumously (Ted Hughes won for Birthday Letters in 1998). Her family (pictured here) accepted the award last night and her son, Patrick Charnley, gave a short acceptance speech that had everybody wiping away tears. ‘Poetry was in Mum’s soul’, he said. ‘For Mum to win the overall prize is staggering. We’re so thrilled. But there is a lot of sadness that she is not here. But she would have been really over the moon, particularly because it was her poetry … She’d have been so pleased to know that her win would bring new people to poetry’. 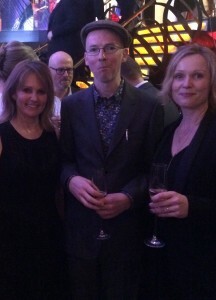 Novel: Reservoir 13 by Jon McGregor (pictured above with me & fellow judge Freya North); Biography: In the Days of Rain by Rebecca Stott Children’s: The Explorer by Katherine Rundell; Debut: Gail Honeyman’s Eleanor Oliphant is Completely Fine. 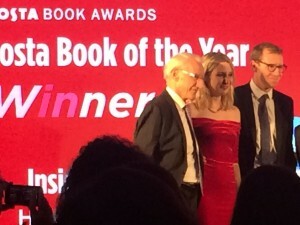 Judging the Costa Book Awards has been a demanding, exciting and at times slightly nerve-wracking experience. I’m delighted to have played a part in shortlisting these four wonderful novels (see dog-eared, coffee stained books in picture below) and finally to be able to press them into peoples’ hands. Why we loved it: ‘An extraordinary novel – poetic, haunting and hypnotic’. A teenage girl has gone missing in the English hills, police set up roadblocks and a crowd of reporters descends on the village. But life must go on – cows are milked, fences repaired, stone cut, pints poured and these timeless rhythms become a force far greater than any isolated tragedy. Flora Mackie is twelve when she first crosses the Arctic Circle on her father’s whaling ship. Now she’s returning to the frozen seas as the head of her own expedition. In this remote frozen land she encounters Jakob de Beyn, raised in Manhattan, and part of a rival expedition. What follows is a powerful love story but also an exploration of science, geography, feminism and humanity. Isma worries about Aneeka, her beautiful, headstrong sister, and their brother, Parvaiz, who’s disappeared to follow the dark legacy of the jihadist father he never knew. When Aneeka becomes involved with Eamonn the charming son of a powerful British Muslim politician the two families’ fates are devastatingly entwined. A forceful retelling of the ancient story of Antigone. Two Oxford city boys, Ellis and Michael, are inseparable in adolescence but when they become men life takes them in different directions. Ellis works at the Cowley car plant, smoothing out dents; Michael heads to London. Then Ellis falls in love with Annie, and for a while, the old friends are brought back together again. Sarah Winman grew up in Essex and now lives in London. She attended the Webber Douglas Academy of Dramatic Art and was an actor for 30 years in theatre, TV and film. She has written three novels including When God Was a Rabbit. Since May this year I have been reading novels for the Costa Book Awards. I’m judging the ‘Novel’ category so there are authors whose work I’ve read before, but also quite a few who are new to me – and some authors I’ve always meant to read and haven’t, until now. It has been an eye-opening experience. One thing that’s struck me is the large number of historical novels (and a few futuristic ones too, it has to be said). Is this always the case? It’s not something you tend to notice unless you have a stack of fifty books to read on your office floor. The better historical novels, I’ve noticed, are less about escaping into the past, and more about reframing the uncertainties and horrors of what’s happening in the world today. Let’s just say I’ve read more than one reworking of a Greek tragedy. This week is the most exciting bit. I’m just finishing reading the other judges’ selections (my two fellow judges chose three books each). This Friday we’ll meet in London to discuss those, along with my own selections. It’s going to be a delight to finally meet the other judges and discuss these books – and to choose a final shortlist from them. I’ll report back soon. 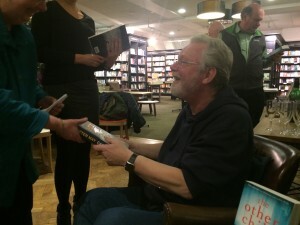 It was such a pleasure to spend an hour grilling crime author Peter May at Waterstones Oxford​ last night about his new book Cast Iron, the final in his acclaimed Enzo series. The most fascinating revelation, for me, is that, after many months of deep research, Peter spends an intense week writing a detailed storyline and then writes the entire novel in only about *seven weeks*. He makes himself write 3,000 words a day, without fail, and will stop practically mid-sentence when he gets to his daily target. He also talked about the wrench of saying goodbye to his beloved character Enzo, after six books. Incredibly, he started writing the Enzo books after his novel The Blackhouse was turned down by every single UK publisher. It was eventually picked up in France, became a huge bestseller, then had British publishers bidding like crazy to buy it. The madness of subjectivity. He chose Quercus Books​ (a publisher we share) because they were small, supportive with an immensely clever and talented staff. The Blackhouse (which became the first in his famous Lewis Trilogy) went on to sell millions worldwide. This is the part of my job that I really love – the chance to learn from a pro (who also happens to be a lovely person). 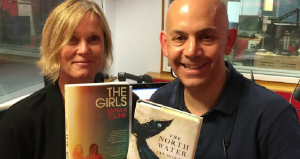 On BBC Oxford 6.30pm tonight I’ll be discussing The Wonder, the new psychological suspense novel by The Room author Emma Donoghue and the brilliant new Ann Patchett novel Commonwealth. I’ll also be going on about a few other books I’m excited about reading this month including new novels by Ian McEwan and Jonathan Safran Foer (his first in 11 years!). 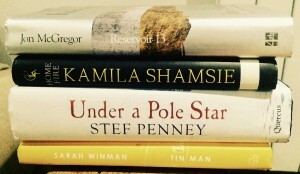 Last time on ‘Prever’s Page Turners’ I was talking about the shortlist for the 2016 Baileys Women’s Prize for Fiction, and, to tie-in with the Charlotte Bronte bicentennial, I discussed Claire Harman’s biography, Charlotte Bronte: A Life, and a story collection put together by Tracy Chevalier, with stories from some of our best contemporary women writers, each inspired by that famous line in Jane Eyre Reader, I Married Him. I also discussed a new Le Carresque thriller A Dying Breed by debut author and BBC journalist Peter Hanington. Tell me about the process of writing I Let You Go, was it smooth? Looking back it does feel as though it was relatively straightforward, but I think writing is a bit like childbirth, in that respect. It’s hard to remember the days when I wept in front of a blank page or pressed delete on whole chapters of work, because the end result is something I’m very proud of. The first draft – plus a bit of editing – took me a year, and then I spent another year working on the manuscript with my agent and editor. 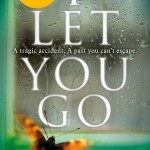 In total I wrote eight drafts of I Let You Go before I was happy with it. It seems an extraordinary number now, but each one took me closer to where I wanted the book to be. What tips would you give to people who are trying to write a novel? Keep going! Easy to say, but far less easy to do, especially with real life getting in the way. But unless you type The End you’ll never have a manuscript to work with, so it’s pointless even thinking about submitting to agents and editors. Most writers, when they start, have day jobs to prioritise, and I do understand how hard it is to juggle a job with writing a book and running a family. But it is possible. 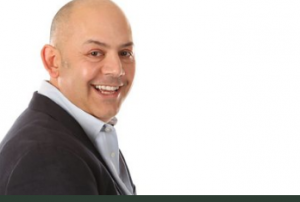 You need to carve out time for yourself, even if that means giving something up: a Sunday morning lie-in, a Coronation Street habit, a night out with your mates. Write 500 words a day – less than this blog post – and you’ll have a first draft in six months. What did you do to find an agent? I’m very lucky, and have never been through the long process of submitting cold and wondering if I’m languishing in a slushpile somewhere. I had been working for a while on a romantic comedy, with the help of an agent a friend had put me in touch with, but I hadn’t been offered representation and I was starting to wonder if my writing simply wasn’t up to it. I had nearly finished I Let You Go when I met with someone who worked in publishing, to discuss the literary festival I had founded. We moved on to talk about my writing, and I explained my predicament. ‘Why don’t I give it to a different literary agent,’ she said, ‘for an objective opinion on whether the book has legs?’ That agent turned out to be Sheila Crowley, at Curtis Brown, who offered me representation shortly afterwards. What advice do you have for writers seeking representation? Tell me about what happened when your agent sent your book out? The book still needed work. My agent knew that, and I knew that, and so the decision to put it out on submission was always a gamble. I should prepare myself for disappointment, I was told. And so I did. A few editors turned it down, but a couple wanted to speak to me. 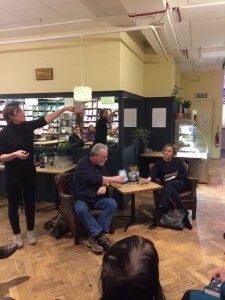 I had a chat on the phone with one, and went to London to meet Lucy Malagoni from Sphere, an imprint of Little, Brown Book Group. Lucy and I hit it off straight away, and there was an offer on the table a few days later. What role does your editor play? Is she or he ‘hands on’? Do they get involved creatively? Lucy is brilliant, and I consider myself incredibly lucky to have such a talented and tactful editor. She’s very good at seeing the bigger picture, and suggesting where a story needs more light; more shade; more tension; more emotional depth. Mostly, that’s where her role stops: my job is to take her advice and implement it. But if I struggle with that – if I can’t see HOW to achieve what she’s so perceptively identified – she’ll take me a step further. I Let You Go is published by Sphere. Last week I was asked to write a piece for Novelicious.com about The Book That Changed My Life. I wracked my brains for ages – thinking of things like Jane Eyre (the ultimate ‘chick noir’ novel, my all time favourite book that still brings me out in goosebumps) or Rebel Pony – yes really – a book I read 15 times aged ten – the book that got me hooked on reading. But then I realised that there is only one book that I can honestly say changed my life. It’s the book that made me believe I could be a writer. It’s the first place I saw my name in print. It’s been sitting on the shelves of every home I’ve ever lived in – so much part of the furniture that I don’t even notice it any more. I wouldn’t dream of reading it for pleasure. But I treasure it. 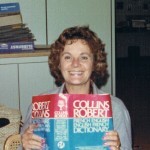 It’s The Collins Robert bilingual dictionary – written, painstakingly, over years and years, by my mum. The first edition was published 1978 (see her proud pic, left). I used to have to fight my way through index cards, stacks of paper, shelves and shelves of dictionaries to say hello to her when I got back from school each day. The family joke is that when The Dictionary was finally published, I was dim enough to be genuinely confused, since I thought ‘The Dictionary’ was a place in our house (‘mum’s at The Dictionary again’ or …’where’s mum?’ ‘The Dictonary’).